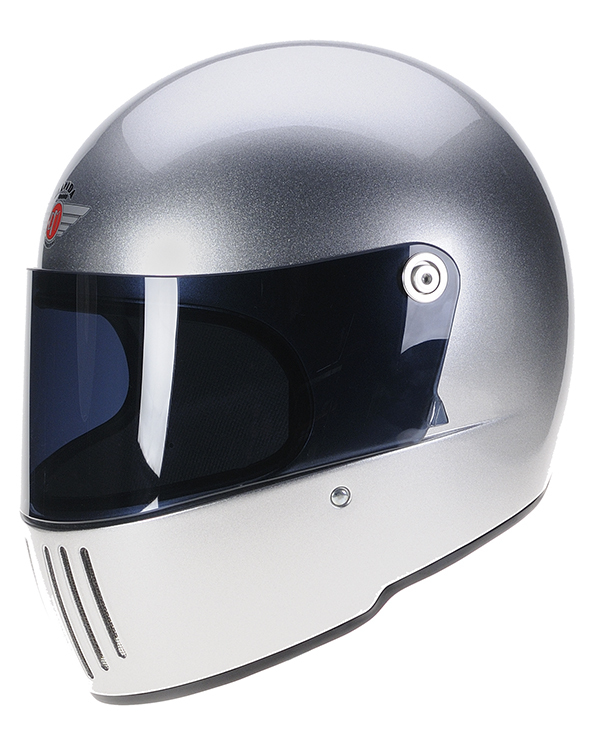 New for 2018, the Davida ‘KOURA’ is a retro inspired, high performance helmet, clearly identifiable as having the characteristic and popular Davida DNA, with an exceptionally low profile and a “strikingly bold styling that will be impossible to ignore on the streets and the track,” says Managing Director David Fiddaman. British helmet specialist Davida has followed up on last year’s well received and extensively updated V3 ‘Speedster’ half shell helmet with another step in the direction of worldwide approvals for its designs and a first entry into the full-face market. Certified to ECER22-05 and shortly to be followed by DOT FMVS 281 and ACU Gold, the new Davida KOURA will be available in early 2018 in both road and race versions. Davida's first full-face helmet is a result of the enhancement of their technical team with the very best expertise of Italian MotoGP and F1 racing helmet designers who delivered the smallest-profile road-legal Davida Speedster V3 in 2016. “The intensification of this collaboration, utilizing access to the latest helmet design technology and expertise, has created another stunning, high quality, modern Davida safety product. “Integrating the clean contours and compact proportions of the 70s and 80s full-face designs, together with key race-bred features, we have achieved an uncompromising fusion of innovative design, exceptional ergonomics and superior comfort that is as authentic in its aesthetics as it is in its advanced technology. “Achieving road safety standards is the start of our design process, it's not the finishing line. We always work to extend the design boundaries above and beyond conventions, and consumer and industry reaction at EICMA, in the heartland of style, was exceptional. Featuring an advanced 'orbital laminated' GPR composite shell construction for exceptional strength, or even lighter, stronger T700 grade racing carbon fiber, the shell shape is designed to give optimal weight-balanced ergonomic performance. Gradually sculptured upwards from front to rear to eliminate clothing interference, six chin air vents provide airflow to a superior optic grade 3 mm ECER22-05 approved F1 performance level anti-scratch, anti-fog visor, with clear and smoke tint replacements available, and optional 3 mm superior optic grade tear-off enabled visors offered for race track or road. Additional features include secure visor lockdown and easy-release mechanism, multi-density EPS shock absorption liners, additional cheek pad inserts for closer optimal customized fitting. It is supplied with a removable, washable, fast drying, anti-bacterial fabric liner that is interchangeable with aftermarket leather liner kits in five colors. Secured using traditional webbing strap and a double-D ring, KOURA is available in the Davida 20 core color range as standard, in two shell sizes, two EPS liner sizes and six different comfort liners in six helmet sizes from XS (54) to XXL (61).